With the long lazy days of summer at an end, now is a good time to get some fall maintenance done on your home before the rains return in earnest. Maintenance now can be especially important to protect your property from the damages of weather and pests during the colder seasons. Dwayne Boggs of Boggs Inspection Services has some tips to get you started. Cleaning up leaves and other yard debris is a useful first step in fall maintenance. Leaves can be placed in compost bins, yard waste containers, or can serve as great mulch for flower and garden beds. When cleaning up around the yard, pay careful attention to leaves and debris against your foundation. While rotting leaves won’t do much to the concrete, leaves piled against siding or wooden frames around basement windows can do a lot of damage. “Leaves and debris can also serve as protection for overwintering pests and rodents,” says Dwayne, “and leaves can cover shelter tubes along the foundation, which are like subterranean termite highways.” While you are cleaning up the yard, don’t forget to empty and rollup hoses, or follow winterizing instructions if you have underground sprinklers. Now is also a good time to freshen up beauty bark or mulch. While you are out in the yard, take care of pruning bushes and trees. Smaller trees and shrubs are simple to prune but you should save the larger trees for the professionals. “Professional tree care can prolong the heath of your trees,” Dwayne explains. It can also find and tackle any weakened branches that could come down during a winter storm causing harm to people, animals or structures. Also, when you prune your plants, ensure that no branches or leaves are up against your home, which could serve as a bridge for pest invaders. With the leaves beginning to fall, now is an important time to make sure gutters are clear. Gutters help redirect water away from the home, and prevent damage from excessive water running down the side of the house. A clogged gutter can do more harm that having no gutters at all, as moss and plant growth holds water to the building, where it can wick up the siding or roof. Practice good ladder safety, as you don’t want to damage yourself or your home, or hire a professional. After you finish cleaning yard debris and pruning, Dwayne recommends you take a walk around the exterior walls looking for any gaps or cracks that bugs or rodents could use to enter your home. Silicone caulk works well for smaller holes. Use hardware cloth and caulk for larger holes to keep rodents at bay. Weather stripping and door sweeps on your doors and windows is also useful. While you are keeping pests out, you are also keeping warm air in the home, reducing heating costs. Before the really cold months set in, now would be a great time to get your home heating system serviced to ensure it is running in peak condition. 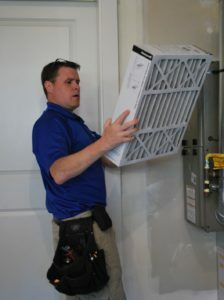 This is also a great time to make sure you have fresh furnace filters to last the season. 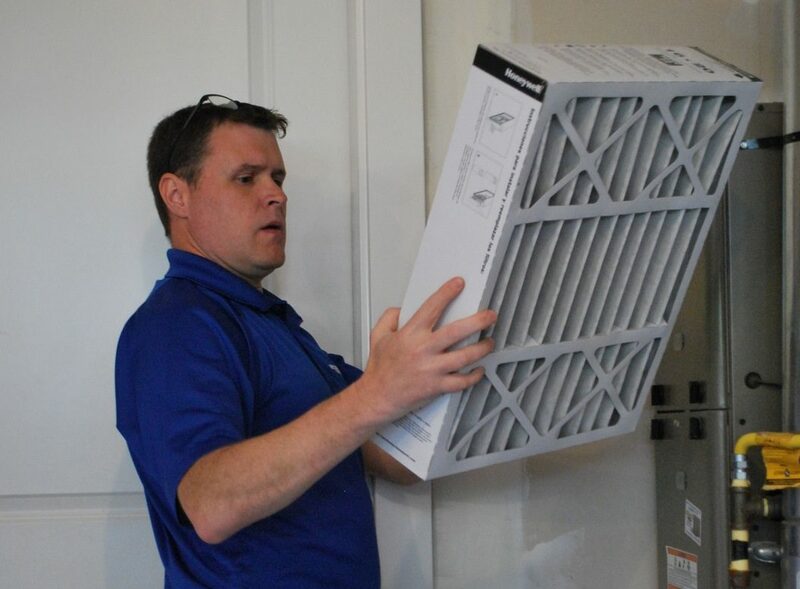 Regular maintenance will prolong the life of your furnace while improving the indoor air quality in your home. While you are at it, make sure furniture, curtains or other obstacles are not blocking wall heaters or air vents that could limit your heating systems efficiency. If you have a fireplace or wood stove you will want to schedule and inspection and sweeping. “Creosote and ash buildup can cause a fire,” says Dwayne. A professional chimney sweep can clean your chimney of buildup, as well as ensure no birds’ nests or other debris has collected in the chimney over the summer. 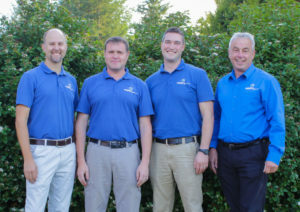 They can also look for other causes for concern like cracking in the chimney crown, or worn flashing which could cause rain to leak in and around the chimney. Now is a great time to ensure you have working smoke and carbon monoxide detectors. You should have a detector placed at every level of the home, but you may need more than one per level depending on your home’s layout. Replacing old batteries with fresh ones will ensure you are not pulling out a ladder in the middle of the night to deal with the low battery chirp that only seems to happen at 2:00 a.m. The fall and winter months are best months to test your home for radon. During these months, windows and doors are not opened as often or for as long. You can learn more about radon risks in your home here. Following these simple home tips, could save you money and the added stress of a midwinter emergency repair. Make sure any professional you hire is licensed and insured. 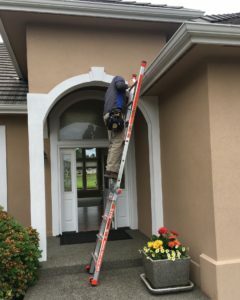 If you would like to schedule a home inspection that will give a more detailed and specific list of maintenance that you should do for your home, give Boggs Inspection Services a call at 360-480-9602 or check them out online.